Rangers Teach every Ashe Co. 4th grader about fossils! Home >> Mount Jefferson State Natural Area >> Park News >> Rangers Teach every Ashe Co. 4th grader about fossils! North Carolina state park rangers at Mount Jefferson State Natural Area have partnered with Catawba Science Center to obtain a collection of fossil replicas and several real fossils to provide environmental education programs throughout Ashe County. This semester, park rangers have visited every elementary school and Ashe Schools of Home Education reaching every 4th grader in the county. Rangers use best practices in environmental education that utilize hands-on learning, music, dialog using the scientific method, inquiry based teaching styles, and even passing around real dinosaur poop! Rangers covered several NC physical and earth science standards involving fossils and geology. This is one example of the interpretation and environmental education provided by state parks in Ashe County. Last year, rangers from Mount Jefferson and New River presented 512 programs to over 10,000 participants. Many of these were school students either on field trips in the park or programs presented in the schools. 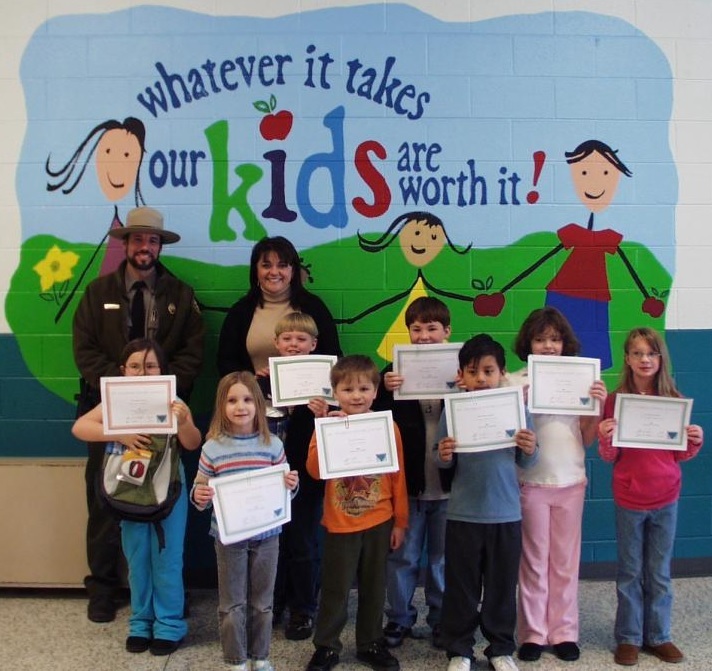 Rangers partner with local schools for many learning opportunities such as Ranger Tom Randolph in the photo above of past Mount Jefferson Poetry Contest winners.